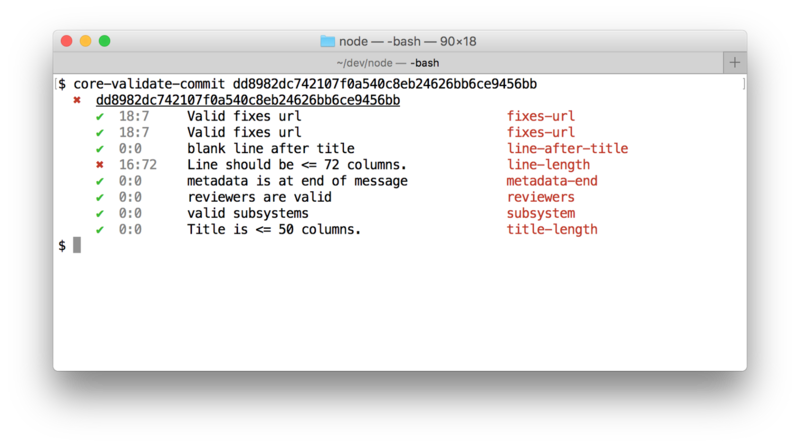 This article lists a few tools, tips, and tricks for Node core contributors. They are in addition to the process laid out in Contributing and the collaborator guide. Node contributions are managed under an open governance model. Everybody is welcome to contribute. Individuals making significant contributions aremade Collaborators and given commit-access to the project. Install it and run it on every commit that you open a PR for and for every commit that you merge as a collaborator. core-validate-commit is invaluable for a smooth review process. Filter PRs that are ready to merge. is:pr is:open review:approved -label:semver-major -label:"in progress"
We annotate every PR with metadata, the PR Url and reviewers. Use this chrome extension and let it generate the metadata for you. The Node repository has a lot of traffic, keeping up to date with all email notifications is impossible. I filter for notifications that specifically mention my GitHub handle and only skim the other notifications. Whatever your system, you probably need some kind of filtering to be effective with GitHub notifications.